Time for Valentine's Day, what are you doing? Any chocolates, cookies or brownies in the making? I love a good brownie. For years, I resisted making it at home and then caved in when Tiny M confessed to a major chocolate love. How can you not, right? 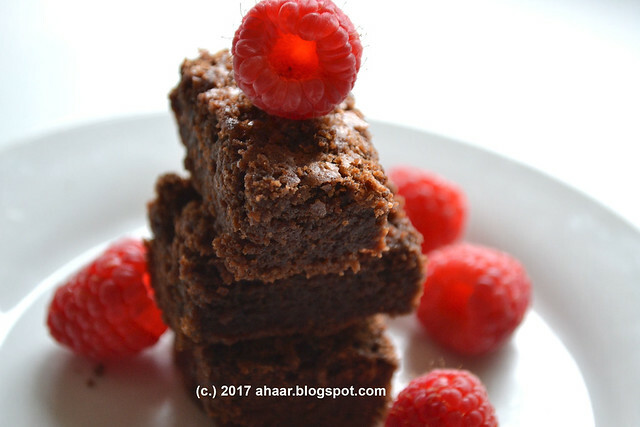 For recipe, I turned to the famous Browneyed Baker's Bake Brownie. I've like that it doesn't use any baking powder or soda like some of the others did. I tried it with only chocolate and only cocoa and the it tastes best when both of them are added. I've made it many times and the brownie turns out just the way we like it, rich, dense, and fudgey. It is rich and indulgent, and just perfect for Valentine's Day. Here is the recipe with my tweaks. For original recipe, click here.